Millstreet has about half a dozen mills that gave the town its name. But it also has almost the same number of ‘holy wells.’ We visited two of these earlier this week, but wondered less about their miracle-working than we did about the saints they are supposed to be linked with. Saint John’s Well, otherwise known as Tobair na Faithni, is on the north slopes of Mushera, about 6 km from Kilcorney and 8 km from both Rylane and Macroom. The well is in a rugged but dramatic location on the slopes of the mountain and at the edge of a new forestry plantation. I could imagine on Sunday, despite the rain and the mist, that on clear days there are expansive panoramic views across the surrounding countryside, looking upwards are the formidable slopes of the mountain, while the valley below is splattered with patchwork fields, glowing rich with colour. Mushera is the highest mountain in the Boggeragh range, and there are three holy wells here, all dedicated to Saint John. But this is best-known of the three wells, and attracts a steady stream of visitors, some attracted by its reputation for offering a cure of warts. A pattern or festival is held at this well each year on 24 June, the Feast of the Birth of Saint John the Baptist. But local people say the well is dedicated to Saint John of Mushera. We found all this very confusing, as the principal statue at the well is of neither saint, but of Saint John the Evangelist or Saint John the Divine, also known as Saint John the Theologian or the Beloved Disciple, the author of the Fourth Gospel and the Book of Revelation. I pointed out that a statue of Saint John the Baptist might be expected to show him as a very hairy figure with coarse clothing – perhaps even carrying his head on a platter, as he is depicted so often in Greek icons. Local legends place Saint John of Mushera in the mountains of Muskerry and say he had three sisters, all revered as saints and named as Lasair, Inghean Buidhe and Latiaran, the patron saint of the nearby parish of Cullen, and each her own feast day on 6 May, 24 June and 22 July. Saint Berihert is said to be a member of the same family, and these legends say Saint John and Saint Berihert lived with their sisters at Cullen before setting out on their missionary journeys, Saint John to Mushera and Saint Berihert to Tullylease. Until about 1940, Saint John’s Day was marked with a pattern at the well. Tents were set up on the mountain near the well, with stalls selling sweets, cakes, lemonade, cigarettes and porter. Pilgrims visited the well in the morning, and the secular entertainment continued for the rest of the day, with singing and dancing. Over the years, however, the crowds dwindled in size, and the pattern was abandoned. Then on Saint John’s Day, 24 June 1954, the late Michael Buckley of Aubane placed a picture of Saint John the Evangelist in the grotto. The late Sonny Buckley from Tullig, near Millstreet, who visited the well later that day, decided to erect a timber altar to protect this picture. A committee was formed in Aubane to build a stone grotto, and when this was completely by voluntary labour the picture of Saint John was placed inside the stone grotto. In 1958, a statue of Saint John the Evangelist was placed in the centre grotto, and two side grottos were built. The statue of Saint John was blessed in 1958 by Canon Costello of Millstreet. The first Mass at the grotto was celebrated on 24 June 1974 and Mass has been celebrated there every year since. When Sonny Buckley died in 1979, he left £500 in his will towards the erection of the Stations of the Cross at the well. These 14 stations were designed by Liam Cosgrove of Blackpool in Cork City. Back in Millstreet, we visited a second holy well at Tubrid, on the western fringe of the town, and once again the three of us found ourselves wondering about the origins of the name of the well, and the saint it might refer to. A sign at the entrance to the well briefly tells the stories of the well, its history and folklore. Local people differ about the identity of the patron saint of Tubrid Well. Some say the well is Saint Gobnait of Ballyvourney, and that the source of the well is there, with the water coming north under Clara Mountain. Others say the name of the well is Tobar Íde, Saint Ita’s Well, and that over time this name was abbreviated to Tubrid. Although the sign does not mention it, another tradition suggests the name of the well is derived from Saint Bride or Saint Brigit. In any case, Saint Ita is said to have been a niece of Saint Brigit and that after she founded a nunnery in Killeedy she stayed there until her death in 570. Tubrid Well has been a place of pilgrimage for the people of Duhallow for countless generations. The well is 40 feet in diameter and is said to be the second largest well in Britain and Ireland. Tubrid Well was almost forgotten and abandoned until the middle of the 20th century when it is said it was rediscovered by a blind man from Limerick. Now large numbers of people visit the well at Tubrid in May each year to pray the Rosary and to drink the waters that are said to have healing properties. According to local traditions a fish appears in the well on occasions, and pilgrims who catch a glimpse of the fish are said to have their requests granted. But while we saw bubbles in the water, we saw no fish, and instead of pilgrims the only other visitor was a man filling large containers with natural spring water – a healing and miraculous alternative to the water that flows through many of our taps today. While I was visiting many places associated with my grandparents’ families in Millstreet, Co Cork – including the mill that gave Millstreet its name, the graveyard at Drishane Castle, my grandparents’ home, shop and pub on the Square, my great-grandparents’ house and pub on the Main Street, and the shop and house where an uncle, aunt and cousins had lived and worked – I was also brought to visit Coole House, one of the main houses associated with my grandmother’s branch of the Crowley family. Coole House is in Coolmore, on the south side of L1120, about 3 km north-east of Millstreet, just east of Drishane Castle and a short walk north to the banks of the River Blackwater. In his Guide to Irish Country Houses, Mark Bence-Jones says Coole House was built ca 1760. Later, Coole House was the residence of Herbert Baldwin O’Donnell (1783-1856), the land agent of Captain Henry Wallis of Drishane Castle, one of the principal land owners in the Millstreet area. Herbert O’Donnell’s father, John O’Donnell of Egmont, was a barrister. Egmont is about 27 km north-east of Millstreet, in an area that was also home to the Perceval family, Earls of Egmont. Herbert O’Donnell was born in 1783. By 1837, he was living at Coole House, according to Samuel Lewis’s Topographical Dictionary of Ireland. As well as being the land agent of the Wallis family of Drishane Castle, he was also a Justice of the Peace for Co Cork, farmed 300 acres. For about 15 years, he was also a churchwarden at Saint Anna’s Church, Millstreet. In the mid-1840s, he gave evidence to the Devon Commission on the land issue and put forward recommendations for its solution. Herbert O’Donnell married Sarah Teresa Ellis in 1811, and they were the parents of seven children, five daughters (Julia Harriet, Mary Ellen, Eliza, Teresa and Sarah) and three sons (John O’Donnell, Nicholas Michael O’Donnell and Herbert Eyre O’Donnell). Herbert O’Donnell died on 2 September 1856 at the age of 73 and his wife Sarah died in 1860 at the age of 69. They are buried in the graveyard beside Drishane Castle. Their first three daughters, Julia Harriet, Mary Ellen and Eliza, died young and were buried with their parents in Drishane. The fourth daughter, Teresa, married Dr Denis O’Connell of Flintfield House, near Millstreet. The youngest daughter, Sarah, married Adeodato da Silva Lima, a Vice-Consul for Portugal, in 1851. Their eldest son, John O’Donnell, married Mary Jane Cantrell in Guernsey in 1844. They returned to live in Millstreet, and he died on 16 March 1860 aged 47. John, Mary and their 15-year-old son, also John, are buried with John’s parents in Drishane. The second son, Herbert Eyre O’Donnell, was born in 1818. He trained at the King’s Inns in Dublin and was called to the bar in 1836, later practicing as a barrister in Co Cork and Dublin. Herbert married Anastasia Constantina Woollett, the daughter of a London coal merchant, in Cobh, Co Cork in 1845. They emigrated to Victoria, Australia, on the Queen of the Mersey in 1866 with their so Herbert O’Donnell, then aged 18. In the early 1870s, he was practicing as a solicitor in Wangaratta. and in 1871 he applied to be admitted to the Queensland Bar. Herbert Eyre O’Donnell returned home soon after and died in Cork on 3 February 1873. The youngest son, Nicholas Michael O’Donnell, inherited Coole House from his father in 1856. He was active in community life in Millstreet and in 1862 he was Vice-Chairman of the Board of Guardians for the Millstreet Union, the equivalent of the local council. In 1864, Nicholas bought the mill in Millstreet that gave its name to Millstreet and that was later bought by my great-uncle, Andrew O’Regan, a brother-in-law of my grandmother, Maria (Crowley) Murphy. A year later after he bought the mill, Nicholas O’Donnell married Jane Chesney in Blarney on 26 February 1865. Jane Chesney was a daughter of General Francis Rawdon Chesney (1789-1872). General Chesney was from Annalong, Co Down, and is remembered for exploring the Euphrates Valley to the Persian Gulf, his accounts of Constantinople, Syria and Egypt, and his report in 1830 on the feasibility of opening a Suez Canal as an alternative to the overland trade route to India and the sea route around the Cape. His report inspired the French diplomat Ferdinand de Lesseps who developed the canal. When the Suez Canal opened in 1869, linking the Mediterranean and the Red Sea, Lesseps greeted Chesney in Paris as the ‘father’ of the canal. Meanwhile, the mill in Millstreet seems to have ruined Nicholas O’Donnell financially. In 1870, a year after Suez Canal opened, Nicholas O’Donnell, describing himself as a miller, filed for bankruptcy. He died before 1876, but his wife continued to live at Coole House until she died at Coolemore on 3 July 1903 at the age of 79. She is buried in the old churchyard beside Saint Patrick’s Roman Catholic Church in Millstreet. Mary McCarthy (1839-1920), nee Bingham, who was born in Kilkeel, Co Down, is said to have inherited Coole House in Millstreet, from her employer Jane O’Donnell. But by 1910, when Coole House was photographed for the William Lawrence Collection, the house was owned by the Perry family. The photographs show Coole House as a long, two-storey Georgian house, with a seven-bay front. Sarah (Perry) Malcolm is standing by a window in the centre of the old black and white photograph of Coole House. Lying to the right is Sarah’s sister, Mary (‘Minnie’) Louisa (Perry) McCulla, to the left is Harry Perry, who has been mistaken for the gardener in some comments on the photograph; above him on the knee of a maidservant is Sarah’s child, Ernest Ray Malcolm; and another, unidentified woman is in the background. Sarah Perry had emigrated to America, where she married, and then moved to Vancouver in Canada. She had returned in Millstreet when the photograph was taken. Ernest Sarah is by the window, and her. Ernest Malcolm later returned in 1990 and visited Millstreet Museum. Some years after the photograph was taken, Coole House was bought by one of my great-uncles, Cornelius Denis Crowley (1879-1972), a brother of my grandmother, Maria (Crowley) Murphy (1882-1957) of Millstreet, Co Cork. For many years, Con Crowley was a director of the Roscrea Meat Company with his brother Jeremiah D Crowley of Wallstown Castle, Castletownroche, Co Cork – the other directors included Robert Briscoe TD and G Fasenfeld. After World War II, Con Crowley also lived at of Finnstown House, Lucan, Co Dublin. 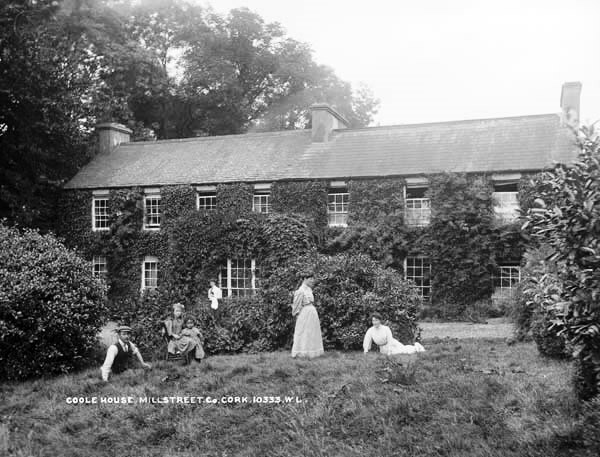 The Crowley family continued to own Coole House, but it by the 1960s it was derelict, and my cousins in Millstreet remember climbing into the house to play in it and wander through it. The describe its marble floors and its fading elegance. When Con Crowley died in 1972 he was buried in Millstreet in the graveyard beside Drishane Castle, alongside his wife Hannah, who died in 1969. Coole House remained vacant for many years and was derelict by the early 1990s, when it was bought by the Duggan family, who carried out extensive renovations. The Duggan family bought Drishane Castle about the same time, and have been active in attracting major international equestrian events and the Eurovision Song Contest to Millstreet. Today, Coole House is owned by Martina Hickey (née Duggan) and her husband. They have completely refurbished the house, so that it is once again an attractive country house and a family home.